Dickens turns 203 on Saturday (that’s a lot of candles), which prompted me to consider in turn the depiction of age and growing up in Drood. Usually when discussions are held on the child in Dickens, critics turn to noted bildungsromans such as David Copperfield and Great Expectations, or the child protagonists of Oliver Twist and The Old Curiosity Shop, but it bears consideration to see how the ideas portrayed within these works are echoed or challenged elsewhere in Dickens’ writings in order to gain a more rounded picture of his attitude to the child. 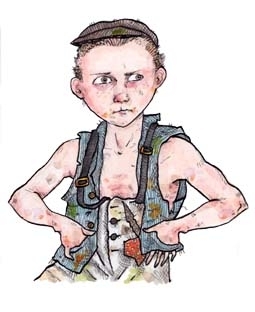 Most strikingly, the angelic, virtuous child of Oliver and Nell is torn to shreds in Drood by the gloriously anarchic Deputy, ‘a hideous small boy in rags flinging stones’ at the stoic Durdles. When Jasper, quite reasonably, stands aghast at this sight and asks the child hand over the stones, Deputy replies ‘Yes, I’ll give ‘em you down your throat, if you come a-ketching hold of me…I’ll smash your eye, if you don’t look out!’: charming, to the last. There is potentially a pointed message within this idea, as in February of 1870 the Elementary Education Act had been passed to try and regulate education across the nation, not without some controversy. Whether Dickens uses Durdles’ unusual approach to education as a means to mock the act, or identify the need for it, is an open question, as is the matter of Deputy’s fate. Is his involvement in Datchery’s investigations the beginning of a humanising of this thing, as Hughes and Crisp suggest, or will he remain unrepentant and savage throughout? Perhaps he would be subjected to the standard Dickensian Etch-a-sketch response to problematic character by being wiped off the scene and sent to Australia (I’m looking at you, Micawber and Magwitch). It had only been two years since Dickens’ life had imitated art and he had sent his own son, Edward ‘Plorn’ Dickens off to Australia at the age of 16 after he failed to show signs of progress at school. His parting letter to his son said, with no trace of irony, that ‘I hope you will always be able to say in after life, that you had a kind father’. The hope of Dickens reflects perhaps more on himself than on his son; the image of the loving champion of the home never quite recovered from the shock separation from his wife and the later revelations about Ellen Ternan, and while I am always wary about relying too much on personal biography to explain literature, I am nonetheless conscious that Dickens’s altered homelife may well have influenced the bleaker depiction of family relationships in the later novels. In Deputy we have not just the abandoned child as depicted in earlier books, but more specifically one with no immediately apparent signs of redemption or salvation. Oliver Twist has long been lampooned for being a remarkably well-spoken for a child raised in a workhouse; his nobility, like Nell’s, is inherent and only waiting to be recognised. Deputy, in contrast, is unrecognisable and prompts fear and disgust in those who look upon him. His only hope lies in the unlikely father figures of Durdles and Datchery, but as I shall discuss next week, the fathers in Drood have their own issues to deal with. This entry was posted in Themes and influences in Drood and tagged BBC, Charles Dickens, Child, Datchery, Deputy, Father figures, Gwynneth Hughes, Nineteenth Century Literature, Oliver Twist, The Mystery of Edwin Drood, The Old Curiosity Shop, Victorian fiction, Walter Crisp. Bookmark the permalink.